You are warmly invited to join us for a tour to Dimboola and district in Victoria on the Labour Day weekend in March. All are welcome. Please pass on this information to others you know who may be interested. You do not need to be a member of our Society to join our Tour. Our Tour Leader will be historian and researcher Betty Huf. 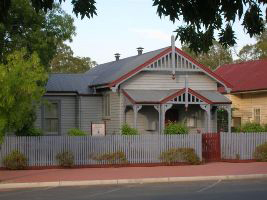 Morning: Meet at the Dimboola Historical Society Courthouse Museum, in Lloyd St, Dimboola (next to the Post Office). The Museum is open from 10.00 am. Morning tea is available for a donation. Lunch: 12.00 pm at Mason Clarke Preserving Co. in Lloyd St., almost opposite the Historical Society, (set tasting menu – $20 each; coffee, cake etc will be extra), or make your own arrangements for lunch. Afternoon: Start tour at 1.00 pm to Lochiel Cemetery (also site of the former Lutheran church), Pink Lake, Glenlee to look at the Alf Traeger memorial, then meet with a local historian at Woorak; Woorak Cemetery (well worth a visit! ); then on to Nhill to see the former Noske flour mill, Nhill Lutheran Church and possibly the Lutheran school. Evening meal: Our evening meal will be at the Farmer’s Arms Hotel in Nhill (order from the menu), where we will be entertained by mystery “eminent” guest speaker(s). We will then return to Dimboola. Evening meal: return to Dimboola for a BBQ at about 6.00 pm, followed by an evening stroll. Possibilities include a short drive along the Wimmera River in the Little Desert National Park near Dimboola, and/or a visit to the Dimboola Cemetery. The destinations will be determined by the wishes of tour participants. Please note that the above itinerary is subject to change. Please make your own arrangements for accommodation. Please book ASAP with Betty Huf (details below) as bookings are desirable for some venues.